T.D.C: Abode Living | Interview & Giveaway! Abode Living | Interview & Giveaway! Located in Melbourne, Abode Living is a family business started by Tom's Uncle Robert Adair in 1991, after leaving his first venture Adairs. Born out of a desire to make designer bed linen that was affordable, Robert realised his dream, with a philosophy that still rings true today. 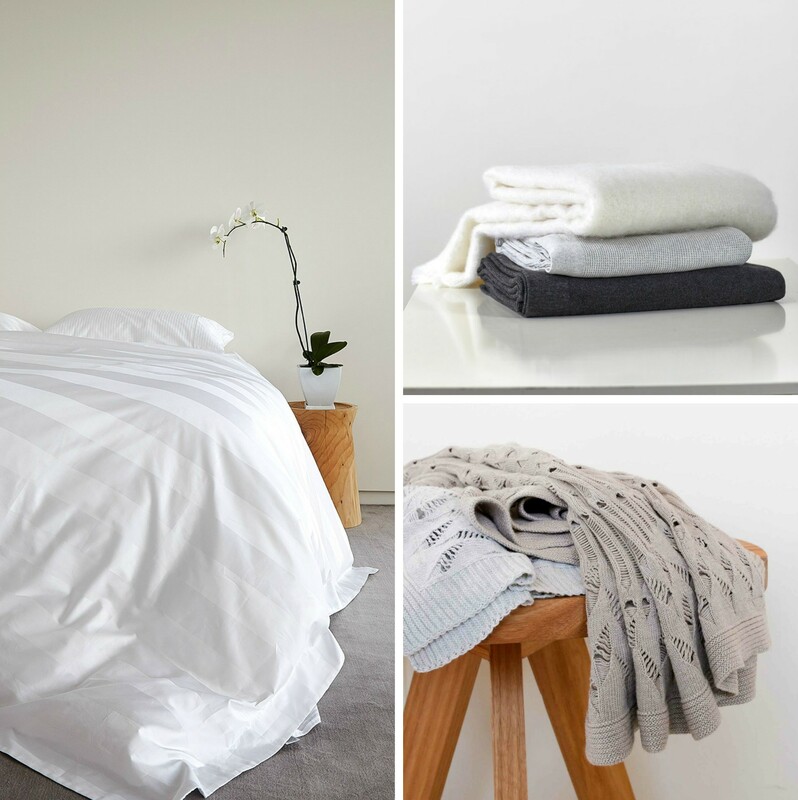 In fact, Abode Living has become synonymous with affordable quality, producing all of their own bed linen in Australia using the very best fabric, down and feather products sourced from Europe. In addition to bed linen, there are many other products on offer including towels, loungewear, table linen and even bespoke bedroom furniture. 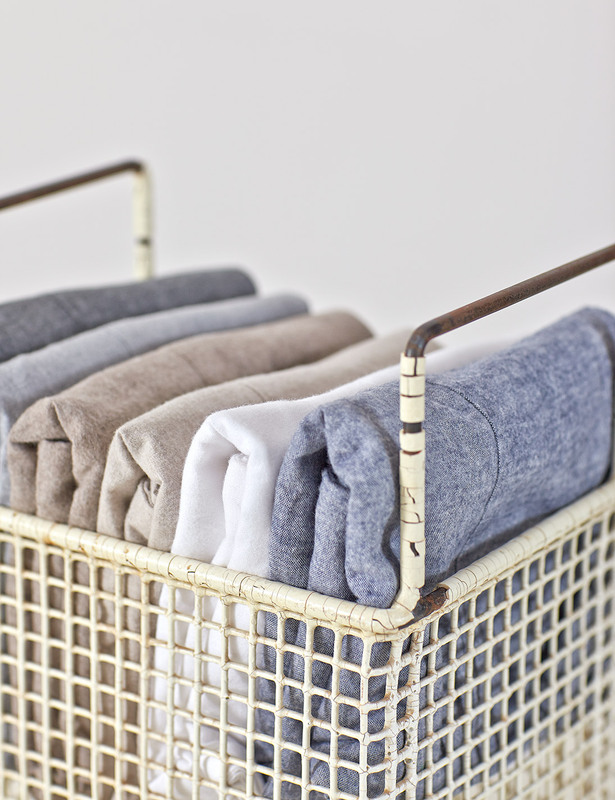 Gorgeous flannel products from the Abode Living Autumn Range. 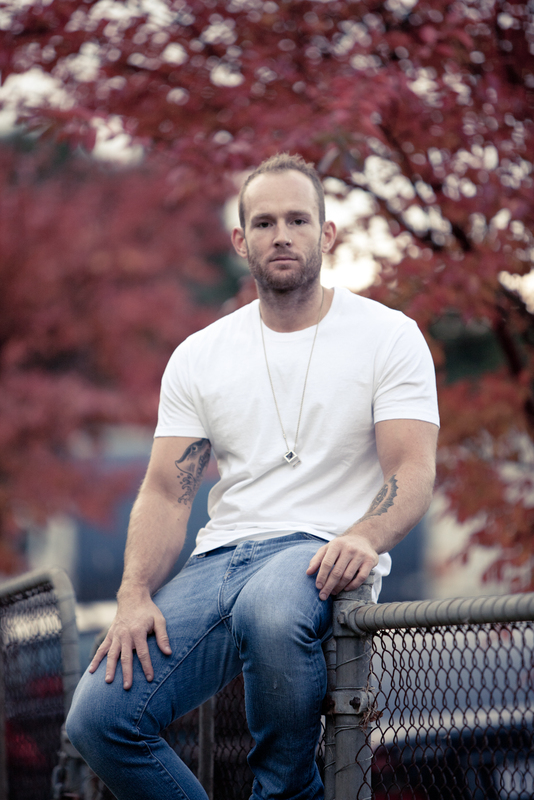 Tom Adair, creative director of Abode Living. Firstly can you tell us a bit about your background and how you came to be working for Abode Living? I've always been a hands on creative, ever since I can remember. My formative years from about 12 onwards were spent in the garage building bunk beds, skate ramps or furniture. I also had a strong fascination with drawing and art which led me to start a clothing label in my final year of high school. Knowing nothing about the clothing business I decided to study fashion at RMIT in Melbourne and acquire the skills I needed to take my business to the next level. At RMIT I actually launched a second clothing label with friends I met in the course – Restinpeace. The four years that followed with this business were my apprenticeship to textiles and textile product design. We were eventually forced to close the label, and that's when my uncle, Robert Adair approached me to work for him at Abode. I was initially employed to design the clothing and sleepwear, but I wasn't really satisfied with that and I ended up working my way into the position of creative director. My fashion knowledge from Restinpeace gave me a different perspective than what traditional bed linen companies maybe familiar with, so I believe that has really helped me develop products that are different in the market place. 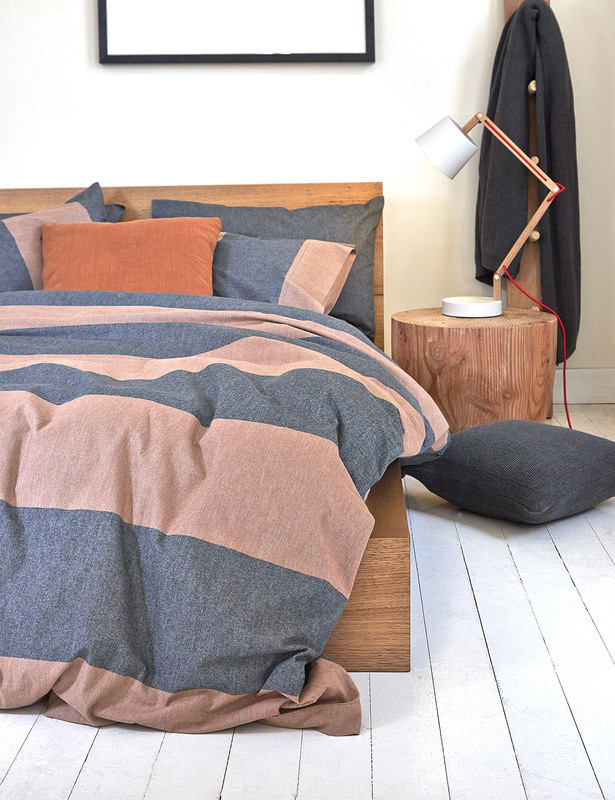 Perfect for Winter, the Abode flannel bedlinen is a best seller. 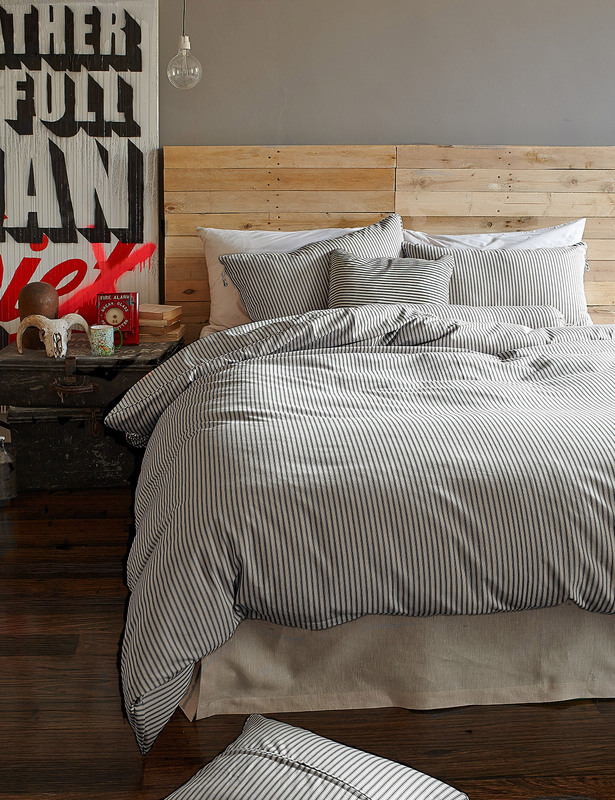 Inspired by vintage mattress coverings, the striped Union Ticking range is a timeless classic, seen alongside a glimpse of one of Tom's artworks, Live Full - 2010. 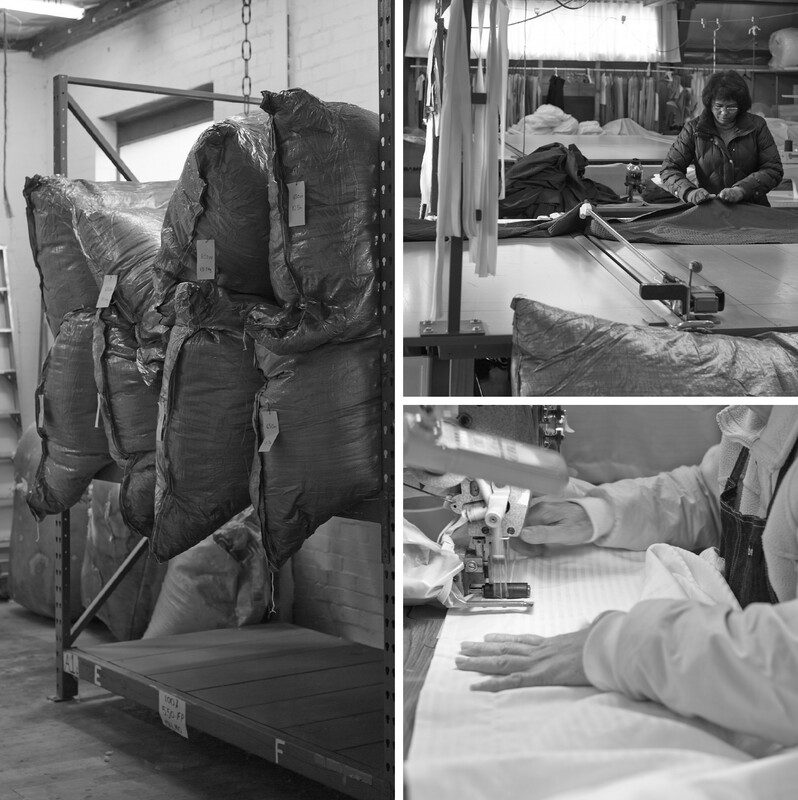 What is special about the bed linen that you produce - how does it differ to other brands? This is the hardest thing for us to educate our target audience about – It's our price and quality. We sell direct to our customers which removes any unnecessary extra mark-up. We actually manufacture right behind our showroom in Melbourne and our fabric is imported direct from Italy on rolls. The fabric is woven in the best mills of Italy (the same mills as Frette) so we know the it's the highest quality cloth available. Because we sell direct to our customers we only make the margin we need, whereas if we sold it to a retail outlet, they would again double the price to make their margin. This guarantees that we sell the best quality for the best price available. It's really hard to explain to customers that they are getting better quality for an affordable price. Some people just don't believe they are getting 'the best' unless they spend thousands of dollars. One of the products I am most excited about is GIZA 45 – it’s literally 'the' best cotton sheet you can buy anywhere in the world. It has to be experienced to be believed. It is rare hand harvested cotton from the Nile Delta, that only yields a limited amount each year. 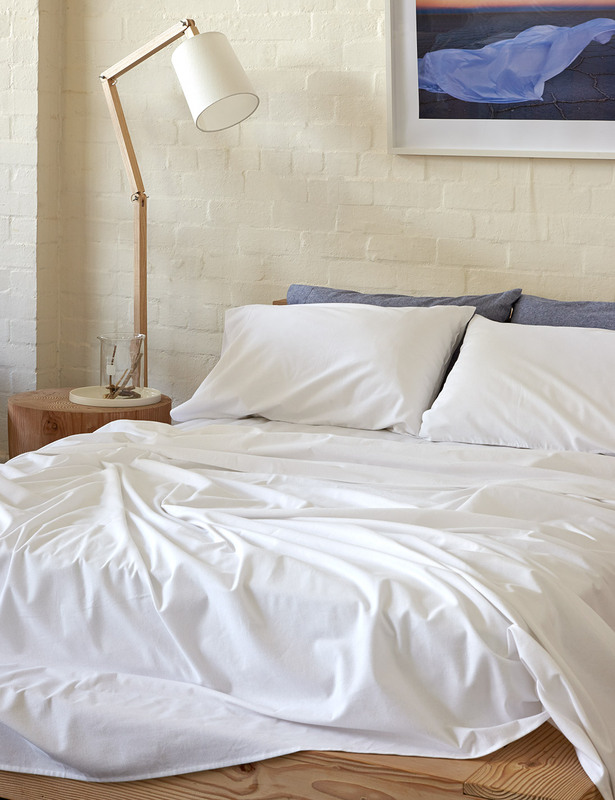 We are the only Australian bed linen company selling it and it has become one of our most popular products.We also pride ourselves that we offer the largest selection of European white goose pillows and quilts in Australia, which are made from the finest imported European materials. We make amazing quilts, as good as you will find anywhere in the world, and they are all made to order and shipped within 24 hours from our Melbourne warehouse. Due to the fact the we make them here, we have the ability to offer refills, adjustments and rejuvenation services for our quilts and pillows. Hand filled to individual preference, the seriously impressive quilt range caters to everyone. The waffle textured Meko in white, paired with beautiful Scandinavian styling. You have your own manufacturing facility behind the retail showroom. Can you tell us a bit more about this side of the business, your custom made services and work with interior designers etc? Additionally we have worked with small boutique hotels, resorts and bed and breakfasts to supply them with our sheets and towels. The Abode Living showroom (top) and manufacturing facility (bottom) in Camberwell, Melbourne. Different climates and personal sleeping temperatures are important factors when it comes to purchasing bed linen, as are pillow preferences. How does your product range cater to everyone? You're right, there are so many factors that need to be considered when purchasing bed linen, quilt and pillows. Everyone is different and requires a considered solution. We have 3 key areas of our business that we have set up in a way that can be tailored to suit each client. 1. Pillows – With over 7 different fillings, each pillow is available in 3 density levels - gentle, medium or firm (in all sizes -Standard, King or Europe) made from Hungarian white goose down and German made shells. If your pillow is too full or flat, just bring back your pillow and we can adjust it to suit your preference. This is something no other pillow company can offer. For interstate of overseas customers they can just send their pillow back via mail for an adjustment. 2. 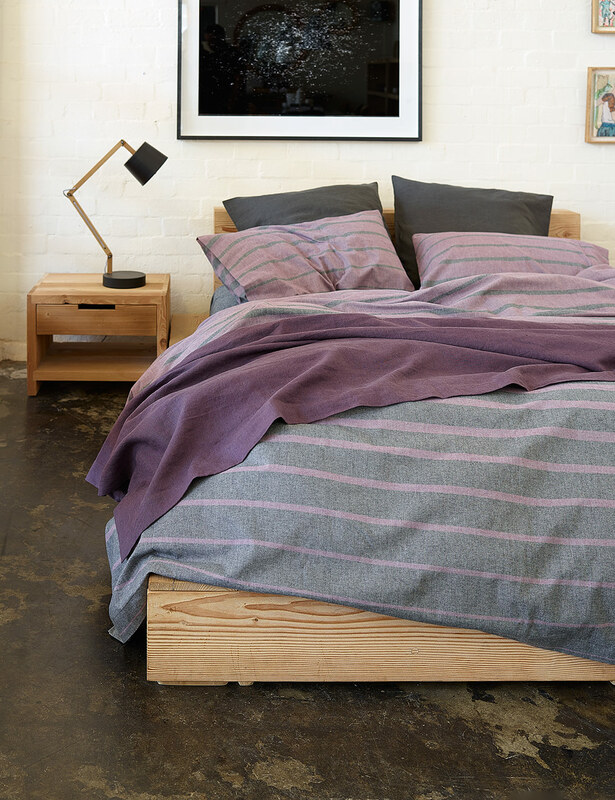 Quilts/Duvets – five warmth levels, made to order in Melbourne and shipped in 24 hours. We offer the largest range of white goose quilts in Australia from 550 to 800 fill power. This allows us to sell the right warmth quilt depending on a customer's sleeping temperature or climate. We even offer a quilt we've coined the "marriage saver" – a different warmth level on each side. If you buy a quilt from Abode, and you find that it's too cold, we are happy to add more down to make it warmer. 3. 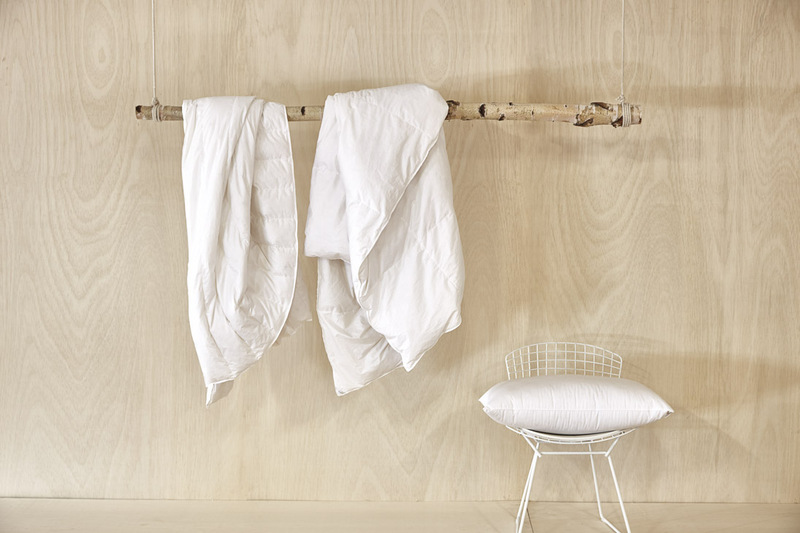 Sheets – everyone is different, some prefer cotton (percale or sateen), linen or our winter favourite, flannel sheets. We have many different ranges to suit all customers from the budget conscious to the lavishly extravagant. The only constant is that our quality is the best and nothing we sell is sub-standard. 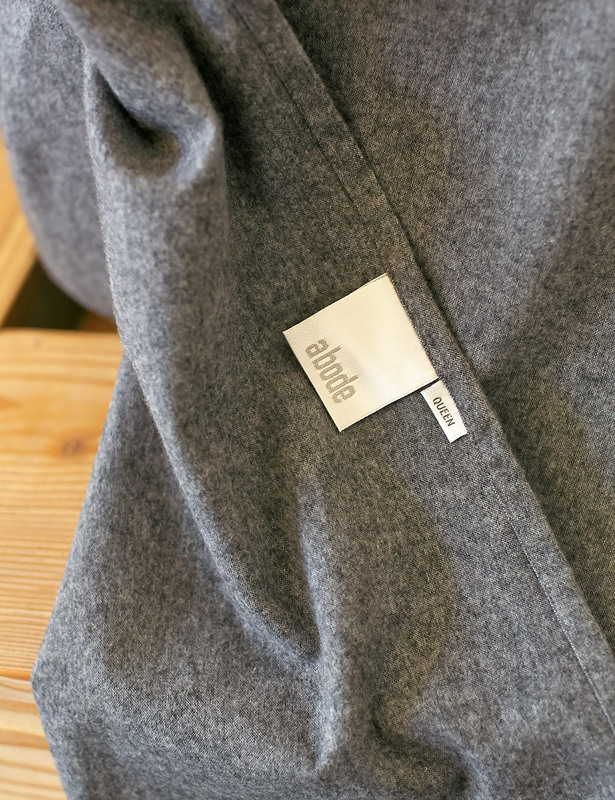 When it comes to quality fabrics and attention to detail, Abode Living more than delivers. The Andes Flannel quilt cover & pillow cases paired with the Citi vintage washed linen. What are your most popular products/best sellers? Flannel sheets and quilt covers have developed a very loyal following. It is definitely one of best winter products. 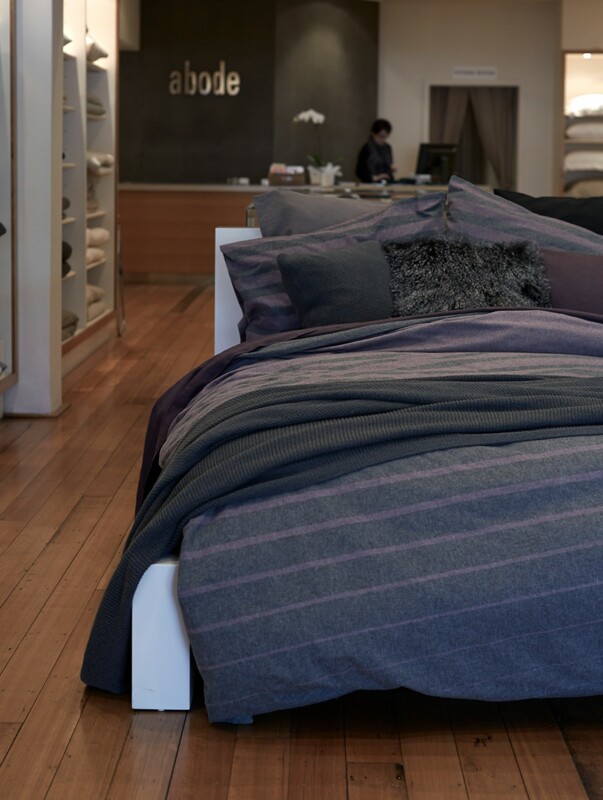 Cashmere 800FP quilts (super king size) – the warmest but lightest quilt in Australia. Fjord 650 Quilt (light comfort warmth level – summer weight). Dublino (Italian Linen has become very popular in Australia over the past 24 months). 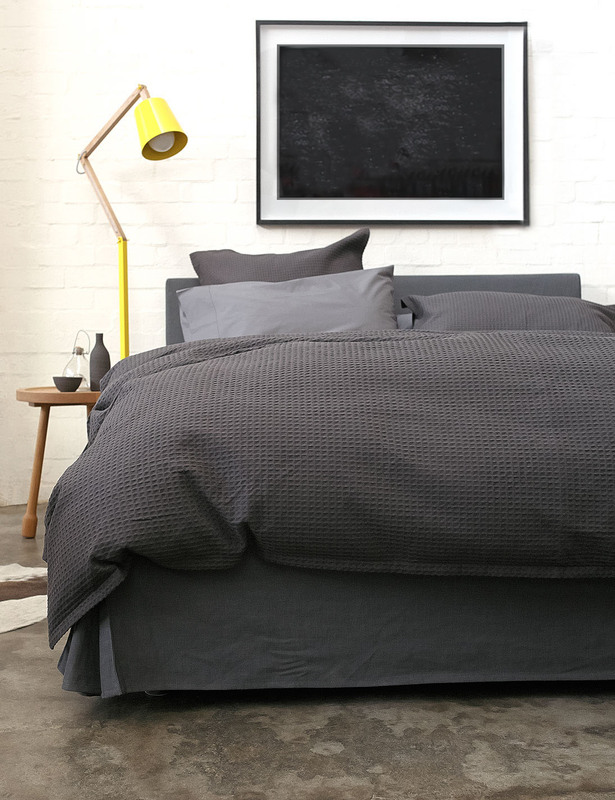 Giza 45 (the best sheet in the world has become one of our best-selling sheets). 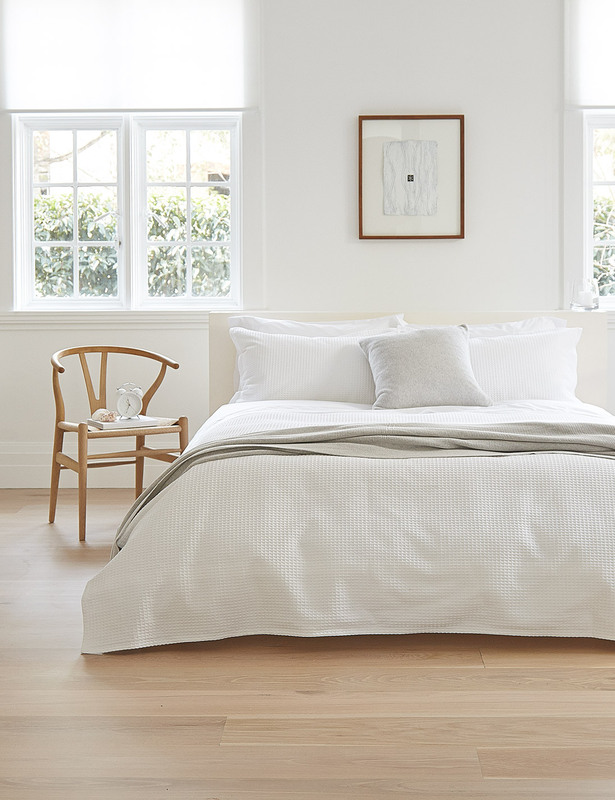 The Aspen flannel sheets come in a range of six new marle colours. The gorgeous range of Autumn flannel quilt covers. Which one would you choose? The new rust coloured Edmonton flannel quilt cover is definitely one of my faves. Can you tell us a bit about the current Autumn range, including new products? Any personal favourites? The Autumn range has a bunch of really exciting new products; Aspen Flannel Sheets in 6 marle colours, 5 flannel quilt covers, cushions and sleepwear. My personal favourites in the bed linen are the Navy marle Aspen flannel sheets, Cypress Flannel quilt cover and the new charcoal Meko waffle quilt cover. We have also recently employed a very talented loungewear designer who has designed our new sleepwear including pyjamas and nightshirts in stonewashed silk (Drea) and our Italian Egyptian cotton (Sia). With fashion as my background these are probably some of my personal favourites, as they fill a gap in the market for affordable, classic luxury sleepwear. New Cushions - I have been working on sourcing some new and exciting cushions from France. I’m really loving the Liberty and Hudson recycled cotton cushions, made from fabric that was originally from papoose carriers and ceremonial skirts that have been hand dyed in indigo before being made. Also, not to be missed are the new Nordic cushions. These things are AMAZING! Double sided and dual coloured Tibetan wool cushions - words cannot describe how soft they feel! 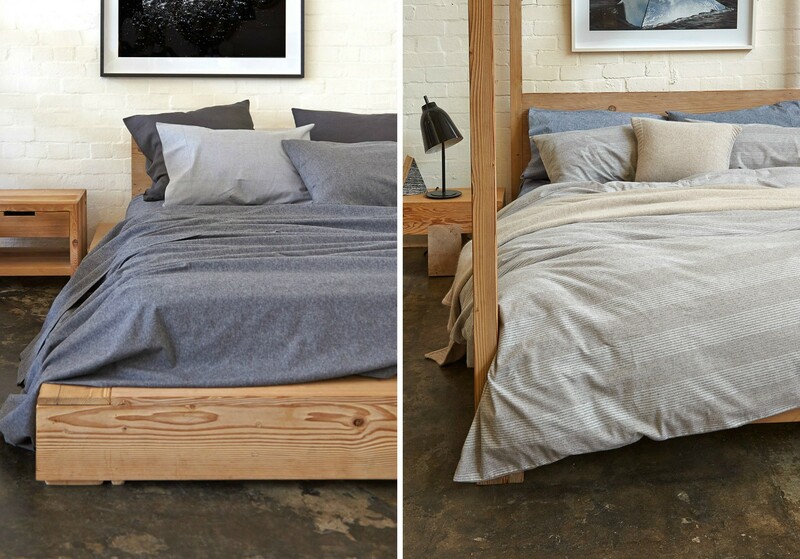 More Flannel goodness with Tom's faves, the Aspen navy bed linen (left) and Cypress quilt cover (right). There's that irresistible combo of grey with a pop of yellow! I love the depth and texture of the charcoal Meko range. Hmm... stonewashed silk or Egyptian cotton? Sleepwear doesn't get better than this! 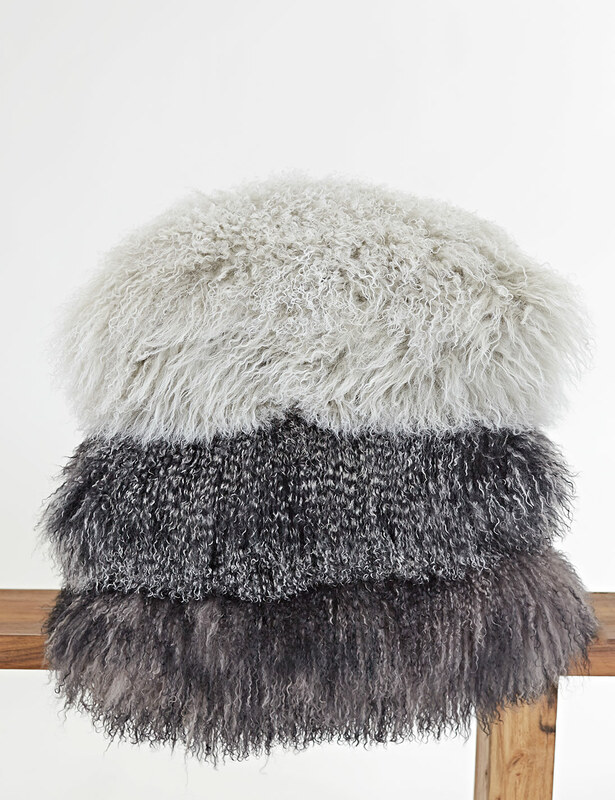 I'm completely sold on these lush Nordic cushions. What can we expect to see in the upcoming Winter range? At Abode we are little different to other companies in the fact that we try not to be too 'fashion' focused and don't release products seasonally. 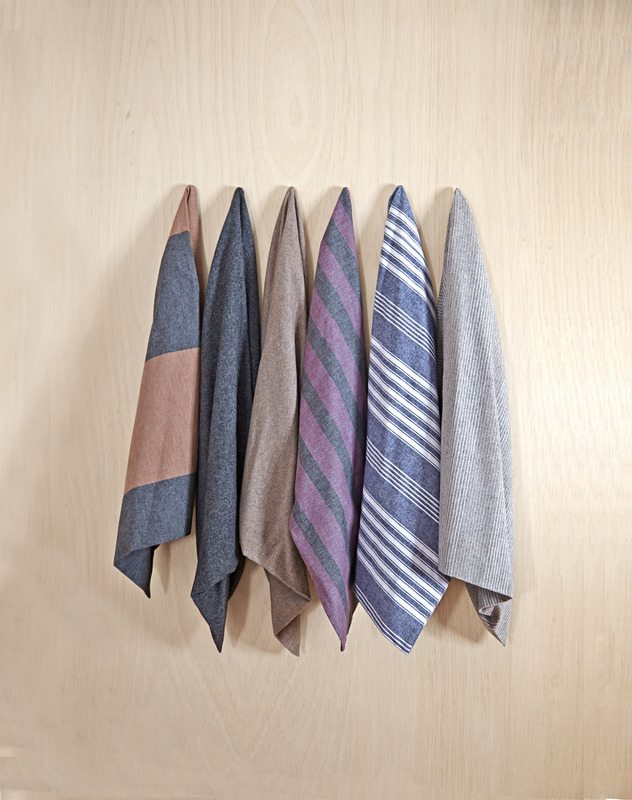 We try to bring in classic colours and fabrics for items that will last longer than one season. 80% of our range never changes – sheets, pillows, quilts etc. The quilt covers are probably the most noticeably different product from season to season. In January we went on a sourcing trip to Germany, France and London and the new products are just starting to arrive.There will be lots on new linen quilt covers - textured, patterned and striped. Some current covers like Maize are re-coloured. Felted Alpaca blankets and cushions from Denmark and acid washed jersey quilt covers. Jersey Sheets will be making a comeback in new colours. Cashmere throws from Italy, cotton blankets, throws and cushions. Exquisite white sateen stripes with the Allure quilt cover (left) and cosy throws (right) in mohair, merino and cotton. What inspires you in your work - international design, websites, travel etc? The finer things in life. I really get inspired by quality workmanship and I want to be able to make these accessible to everyone while still being as affordable. I am influenced by fashion trends, and try to translate the classics into our range, whether it be colours, textures, fabrics or details. 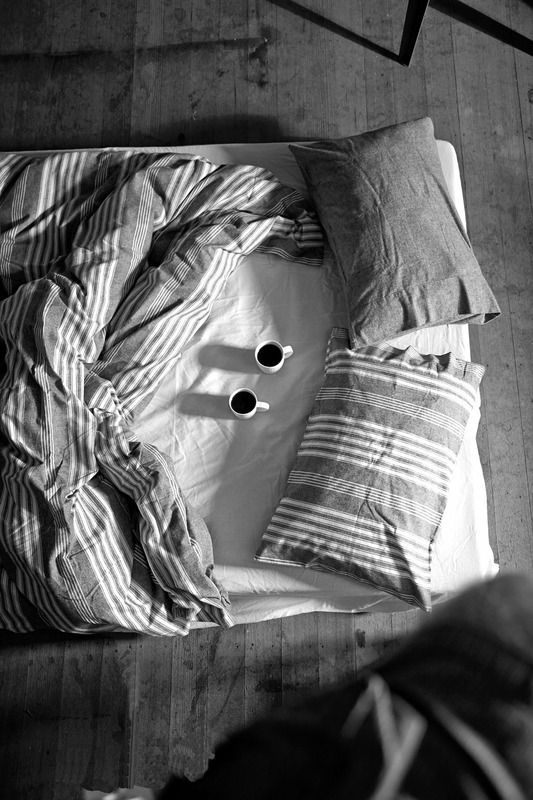 One of my design philosophies is "You should dress your bed how you would dress yourself". The classics just never go out of style. From a business point of view, I definitely keep abreast of overseas website trends, as I think the UK and US markets are really leading the way in online shopping. With Australia being so vast, there is a huge online market to cater for and I think generally online shopping in Australia is letting down our consumers. For travel I love Mexico, LA, New York, Paris and I draw subtle influences from their look and cultures. My interior aesthetic is a mix of neutral Scandi base colours with a pop of urban/industrial highlights thrown in. For products I take inspiration from everything around me, wherever I go. I try to see past what’s actually in front of me and try to interpret it in a different way. I also look to tattoo designs, typography, Pinterest and music for inspiration and new ideas. 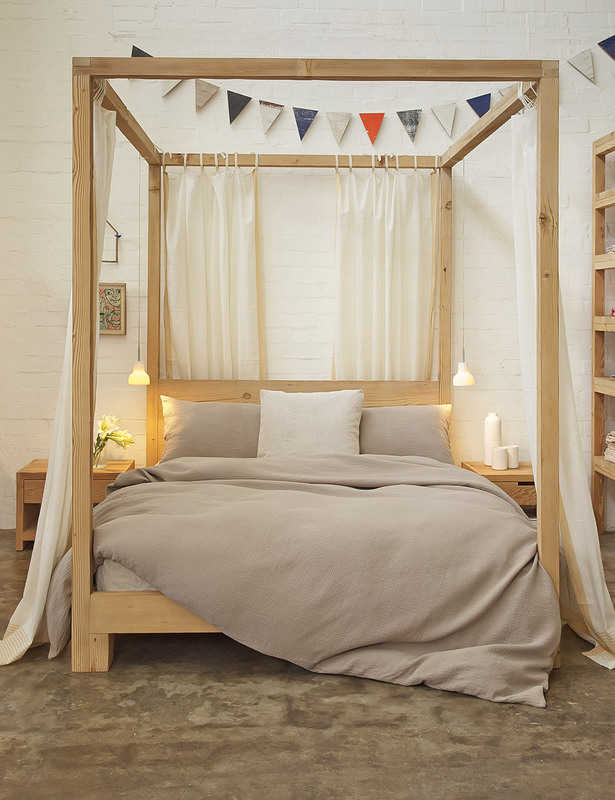 Stunning neutrals with the Maize quilt cover. 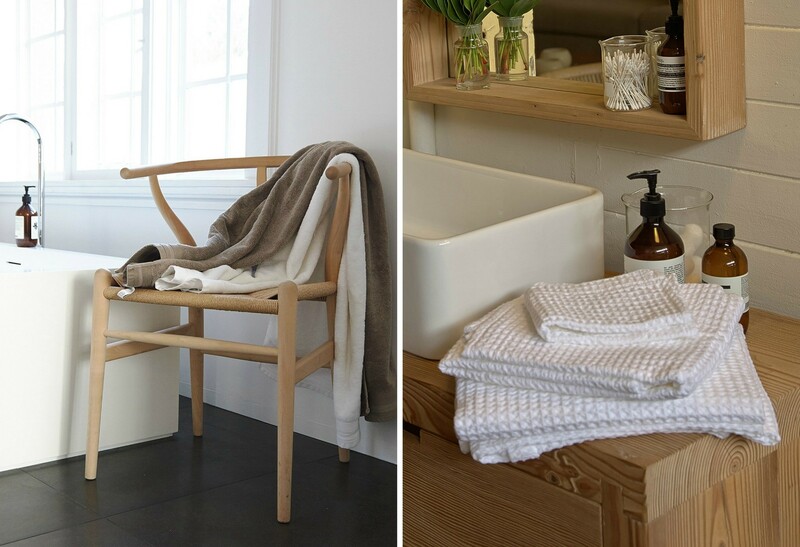 Abode Living also offers a beautiful bathroom range including towels, bathrobes, accessories and skincare. Your artwork must be a great creative outlet. How does it compare to your work with Abode Living? Are you working on anything special right now? 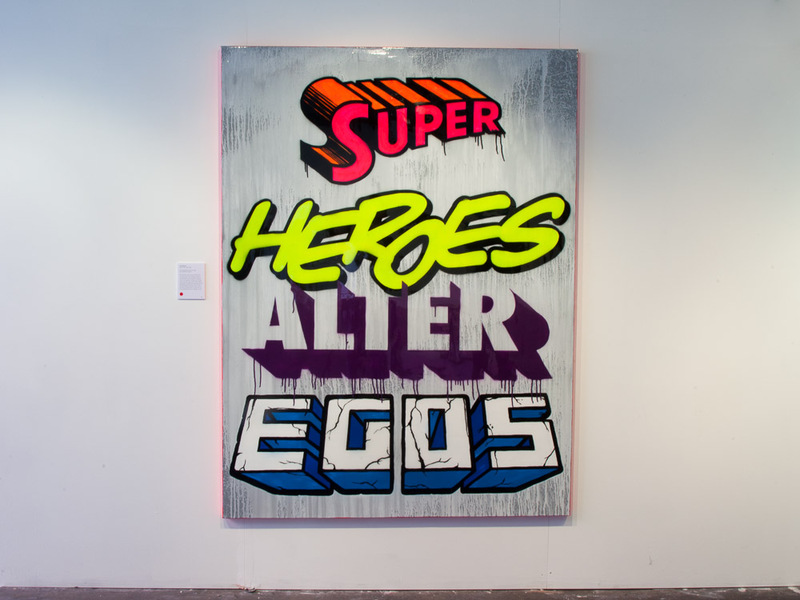 When I was studying I was heavily influenced by the graffiti scene in Melbourne. There was turning point in my life where I decided to create artwork that could be kept or even sold rather than apply it to walls. I wanted to bring this street/urban element into interior spaces. I guess that’s where my artistic inspiration comes from. When combined with Abode I found that I have a really strong and rounded appreciation for creating interior spaces and aesthetics. My artwork allows me to do and express my thoughts without worrying whether or not they'll sell. I only make art because I love making it. 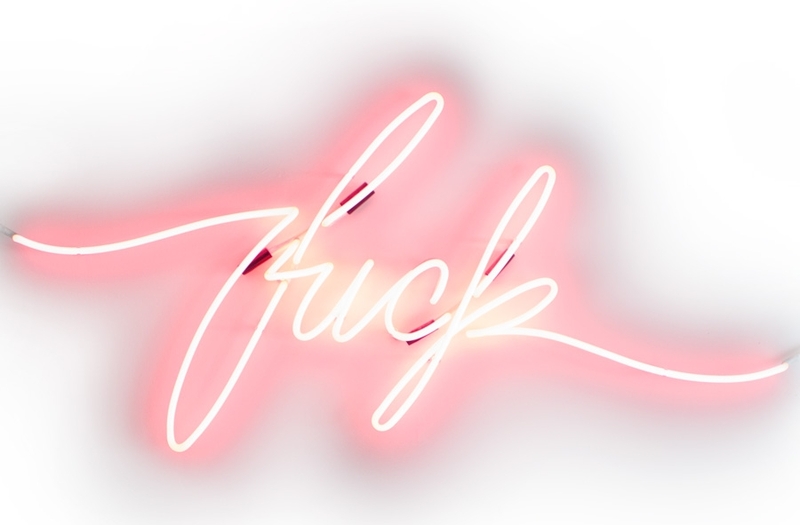 I like creating pieces that make people squirm and give a reaction. 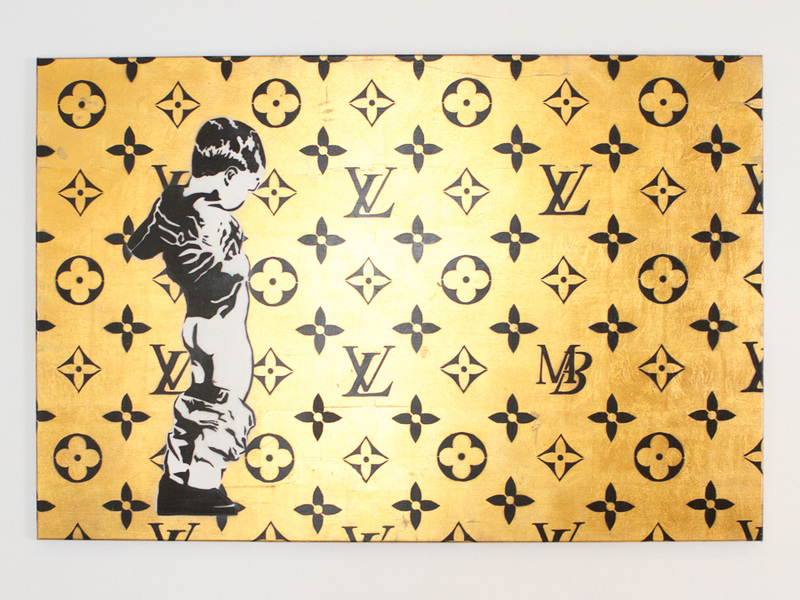 It's the shock-value, or the smile when someone is looking at one of my pieces - that's where my satisfaction comes from. I have a few commissions I'm working on and after that I will be working towards my first solo exhibition. It's a daunting thought as to how I'll find time, but it's something I've always wanted to do. Tom's artworks definitely make me smile. See more of his incredible work at Juan Mcarb. The winner gets to choose any colour and size they like. To enter, pop over to Abode Living and request a catalogue. You must select the source as 'Design Chaser'. If you're already on the mailing list, leave your name in the comments so that we can confirm this and place you in the draw. NOTE: The giveaway is open to readers worldwide, but only includes free shipping within NZ and Australia. If the winner resides outside of NZ or Australia, they must pay for shipping. The competition will close at midnight, NZ time (UTC+12) on Monday, 17th June. The winner will be chosen via random.org and announced on Tuesday, 18th June via the blog and Facebook page. Readers will also receive an ADDITIONAL 10% off the entire site valid for one week from today. 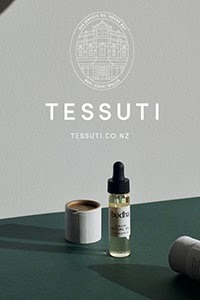 All orders over $200 to NZ & Australia will be eligible for free shipping. Enter the code DESIGNCHASER at checkout. PHEW!! I told you it was big one! HUGE thanks to Tom for his brilliant interview and for this standout giveaway. Good luck everyone! UPDATE: Competition/reader offer now closed and the winner has been announced. Congratulations to Christine Stockum! The catalogue request won't work for me? 'Please select an item in the list' is the error message I get. Just entered! Great prize. Love abode. EXCITING!! Such an AMAZING prize - such a lovely way to start the week - thank you ever so much!! I can't enter as I already subscribe to their catalogue mailout. (Can't do so twice) Is there another way to enter? Its just what I need indeed. Just moved into my new home & it needs lots of new luxurious accessories. Love Abode.....my boss bought a flannel set recently and I've been green with envy ever since! The staff are amazing and so helpful too! Done! What fantastic things available!!! seriously Miss Design chaser, i hardly ever enter comps...but all this delicious linen you through our way...you have found my weakness. this chilly saturday morning, all this gorgeous flanel looks like heaven. thanks for indulging my eyes with all the goodness in your blog. love it. Such a beautiful blog about a true creator. The vision and inspiration that Tom has shows through in all that is Adobe Living. I too has trouble subscribing to the catalogues and registering on the website so sent an email to the contact address. I received a near immediate response from Tom answering all of my questions and going the extra mile to help. It is so wonderful to find someone so passionate about their work and so committed to service. I have already ear tagged my catalogues and definitely look forward to saving my pennies for some of these opulently exquisite items. Thank you so much Michelle for showcasing this beautiful company. And I so hope I win this competition! What an incredibly generous gift - this again shows the beautiful vision of Adobe. Devine products! Thanks for the opportunity. I only just got here in time. Brilliant photography; the product range is simply scrumptious! Thanks for the generous giveaway! 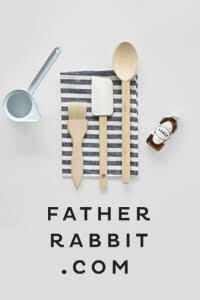 Love love love abode and am already a subscriber, please count me in! guess I'll just sum it up what I had written and say, I'm thoroughly enjoying your blog.